McKenzie Contracting was organized in 2015 as a residential landscaping and home improvement company. Since then, we have grown into ourselves and found that our specialties extend far beyond that line of work. Services provided now include tree removal, snow/ice removal, lawn care and maintenance, sediment/erosion control, stormwater management, environmental remediation, hardscape design and installation, skid steer services, light excavation, pier re-surfacing, bulkhead installation, and much more. Gene was born in Annapolis and raised in Calvert County. He is proud to be able to say he was raised in Southern Maryland. He graduated from Huntingtown High School in 2007 where he excelled in academics and was captain of the football team. From there he continued his education to Salisbury University, earning his degree in Environmental Studies and playing on the university’s rugby team. His education has always been a priority, which he shows by continuing to educate himself on the industries latest regulations and techniques. As an avid outdoorsman on his spare time, Gene takes pride in promoting environmentally friendly construction techniques and design. From sediment and erosion control practices to installing pervious pavers, the filtering of storm water is a top priority to McKenzie Contracting’s overall performance. All areas serviced by the company are in the Chesapeake Bay Watershed, making the environmental practices that much more important. This sense of mission is what sets our organization apart from other outdoor construction companies. Carlice is a recent graduate of Towson University (2014) and is responsible for keeping the administrative side of the organization in check. She holds many hats in the office, staying on top of responsibilities such as licensing requirements, permitting, insurance, payroll, accounts payable/receivable, human resources, and so much more. She has filled the position well and goes above and beyond when dealing with both employees and customers. Apart from her role in managing the office, Carlice is a loving mother of a beautiful girl, Sadie Marie, and takes on that duty with as much pride as she does at work. Her and Gene have been married since 2015 and are excited to start their young family in the Southern MD community. You may see Ed in the field working, driving a dump truck delivering material, get an email from him regarding your most economic solution, or see him show up for your first estimate meeting. He holds many hats in our operation and helps provide the best support for both our company and our customers. Ed’s background is in building products. He retired in 2015 after 25 years of loyal service to a national lumber and building supply company. As a Regional Vice President he was responsible for over 70 store locations. He knows a little something about operations. 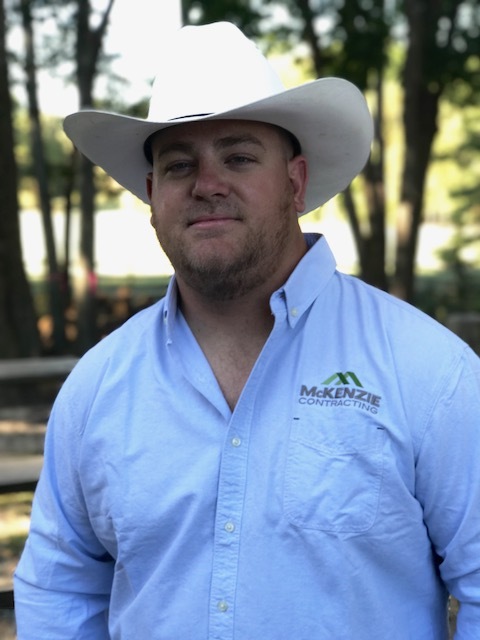 He brings his experience and professionalism to the work place every day and does his best to ensure you have a positive experience when working with McKenzie Contracting. Manuel is a young operator but isn’t scared of any machinery - big or small. You will see him in the excavator ripping out stone or stumps, in a track loader loading dump trucks, or even have a chainsaw in his hand cutting up trees. His young attitude and great work ethic make him an asset to the McKenzie team. Reyes serves as our tree foreman and hardscape professional. He will throw on a set of tree spikes and be 120’ in a tree before you know what’s going on. Cutting trees for over 20 years he has seen them all and can identify any tree and the best way to safely remove it. Operating a chain saw or setting retaining wall block, having Reyes on your project is always a good time guaranteed to be be filled with hard work and laughter.